Millions of Americans in the Midwest experienced extremely low temperatures last week, leading to many suspended services. 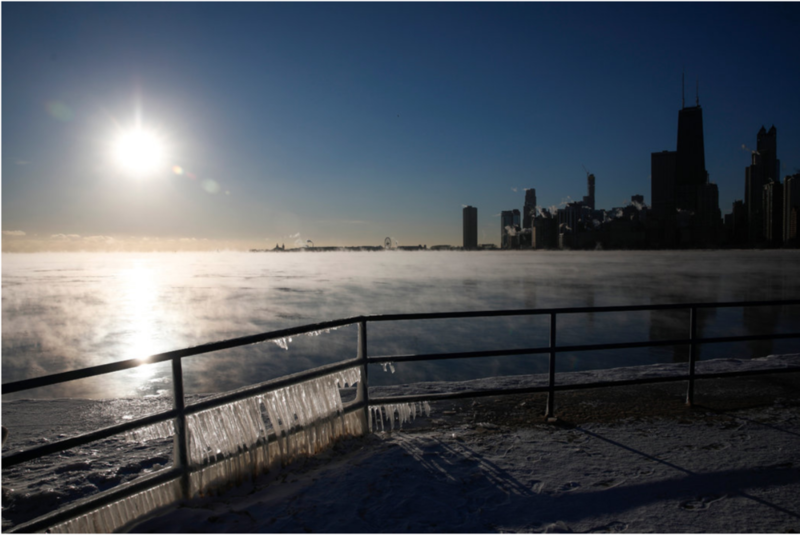 Scientists link the polar vortex that caused these temperatures to climate change, and warn that more will come. States like Michigan, Wisconsin, Illinois, and Minnesota experienced wind chills close to negative 50 degrees Fahrenheit, disrupting ordinary life. Governors in Wisconsin and Michigan declared states of emergency and closed all state run government offices. Hundreds of schools in the Chicago area closed, and many museums, restaurants, and government buildings were forced to close as well. Notably, the Postal Service had to suspend service in nine states. The deep freeze has also tested power systems, leading to power outages. Along with residents using more power to heat their homes, the windy weather is straining power stations and infrastructure that delivers power. On Tuesday, a snapped powerline caused outages for 5000 residents in Minnesota. For fear of gas outages, Michigan Governor Gretchen Whitmer asked residents to limit their thermostats to 65 degrees Fahrenheit. Officials have linked at least eight deaths to the deep freeze. Some were found frozen to death outside, including a University of Illinois Student who was found behind an academic hall, and an elderly man who was found dead a few hours after he fell on his way home. Cities in the East also experienced cold weather following the Midwest. New York City experienced wind chills of negative 10 degrees Fahrenheit, and the city was held under a wind chill advisory for a few hours, although no major disruptions occurred. Early research has attributed the polar vortex to climate change. Some scientists have found that especially high temperatures in the Arctic, coupled with changes in the jet stream caused by climate change, caused the polar vortex of the Arctic to split and bring cold weather usually reserved for the Arctic Circle to America. Yet, many Republicans have seized on the news of cold weather to dispute “global warming.” President Trump tweeted, “ In the beautiful Midwest, windchill temperatures are reaching minus 60 degrees, the coldest ever recorded. In coming days, expected to get even colder. People can’t last outside even for minutes. What the hell is going on with Global Warming? Please come back fast, we need you!” Although Trump pointed out that America was experiencing colder weather than usual, the global temperatures on January 29 were 0.5 degrees Fahrenheit warmer than average.